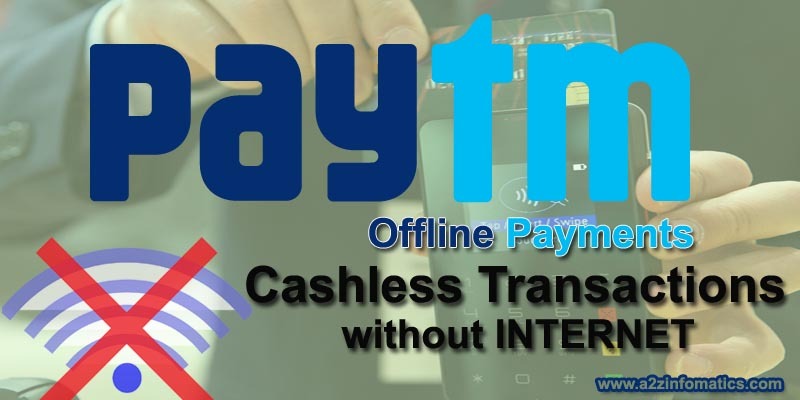 On 7th of December 2016, one of the widely used cashless payment service Paytm announced, shortly no need for any internet / data connection to make cashless transactions using Paytm. According to the reports from some reputed sources, there will be a new feature for non smart phone users to make any cashless transaction without the need of any internet / data connection. People with the smart phones and internet connection can also enjoy this new Offline Paytm Payments feature, to save data connection bills or in the situations where internet network is not available. How to Make Cashless Payments without Internet – Offline Paytm Transactions. To make cashless payment transactions without the necessity of any internet connection, there will be two ways to complete any cashless transaction. This offline cashless payment facility will be provided to all the registered Paytm users, just make it sure that you have an active / working Paytm account. Below are the proposed ways to make Offline Paytm Payments without Internet facility. Offline Paytm Payments / Cashless Paytm Transactions by making a call to Toll Free number 1800-1800-1234. To make any cashless Paytm payment transaction using Paytm toll free number, the user has to create a 4 digit PIN by logging into the Paytm desktop version OR Paytm mobile app. Once the Paytm user has created the 4 digit TIN, the same will be used to validate the user, at the time of making any telephonic cashless transaction using Paytm. The user just have to dial Paytm’s Toll Free number 1800-1800-1234, the system will ask your 4 digit verification PIN. After the verification of the 4 digit PIN, you will be asked to provide beneficiary phone number and the amount you wish to pay to the beneficiary. 2)- Offline Paytm Payments / Cashless Paytm Transactions using OTP and a Bar Code. To make and validate offline cashless transactions using Paytm, a one time password (OTP) and a Bar Code will be generated. For the safety measures, this OTP will get refreshed after every 60 seconds. The person at the sending or receiving end can choose among an OPT or the Bar Code. Any of the both parties, can enter the OTP or scan the Bar Code for the instant funds transfer. Before trying any offline Cashless payment facility, just make it sure that there is sufficient balance (money) in your Paytm wallet. You can anytime load the cash into Paytm wallet using credit / debit cards or netbanking facility. You can also visit any nearby cash-in points to promptly recharge your Paytm a/c. Important: The Non KYC Paytm customers can only add Rs. 10K in a calendar month to their Wallet. The KYC Paytm customers can add any amount of the money to their wallet, they just have to make it sure that the wallet balance never exceed Rs. 100K. Things are settling slowly but surely after the recent demonetisation. Things would have been more worst without the presence of the Paytm at that period. It will definitely take some time, when large portion of the population will actually go cashless. This new Offline Paytm Payments feature will help the cause for sure, as the Smart Phones are still out of reach for many individuals. We hope, they all will understand the benefits and join the cashless network very soon. This offline Paytm Payments feature has added a new dimension to the cashless transaction facility. If you find this new offline Paytm feature helpful and willing to use it in your future payments, please do share your experiences of using this cool Paytm feature under the comments section below. Believe us, that will surely motivate other people to go cashless. Thanks for your visit, Keep visiting our blog, we will be back SHORTLY, with more quality stuff like this. God Bless Everybody.